All living organisms are classified into various groups with different degrees of relatedness. In the plant kingdom, the various levels of classification include class, order, family, genus and species. The genus and species names together comprise the scientific name that every plant (and animal, too) is given when first described by a scientist. These species names are recognized by botanists, horticulturists and gardeners no matter where you go in the world. 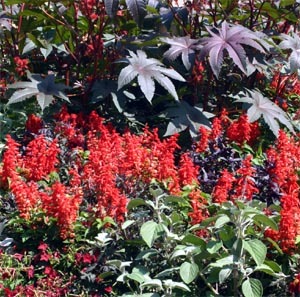 Salvia splendens (red flowers) with castor bean (Ricinus communis) and Alternanthera. A botanical name consists of two words, and is therefore referred to as a “binomial.” By convention, the name is printed in italics. The first word represents the larger group the plant belongs to, the genus (plural genera, NOT genuses), and the first letter is always capitalized. The second word is the species (both singular and plural; specie is not a word in botany) and is always lowercase. There can not be more than one identical species name in each genus. The species name is often (but not always) descriptive of some aspect of the plant. For example, splendid scarlet sage is Salvia splendens, northern red oak is Quercus rubra, and the hawthorn Crataegus missouriensis was named after the state of Missouri. The genus name can be used alone when discussing a group of plants, but the specific epithet is NEVER used by itself. Once the genus has been used in a paragraph, or is understood, it can be abbreviated, such as S. splendens. An unspecified (or unknown) species in the genus Salvia would be written as Salvia sp. To denote more than one species in the genus, it is written Salvia spp., with two p’s. Common morning glory, Ipomoea purpurea. In more technical publications there may also be a person’s name after the genus and species — the last name of the person that described the plant. Carolus Linnaeus, the Swedish naturalist who first invented the binomial system of nomenclature in 1753, described and named thousands of species of plants and animals; if he described the species, the author name is typically just the abbreviation “L.”, but any other name is spelled out. If another scientist later decided that plant really belongs in another genus, then the original author’s name is placed in parentheses and the person who changed the classification follows. 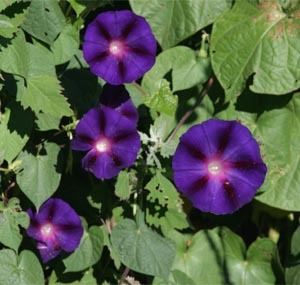 For example, Linneaus originally named the common morning glory Convolvulus purpureus in 1762, but it was renamed numerous times by taxonomists in the nineteenth and twentieth centuries, with Albrecht Roth finally assigning it the currently accepted name Ipomoea purpurea (L.) Roth. When the name change is relatively recent and/or a large genus with many familiar members, both names may be written to clue the reader to the revision: Ipomoea (=Convolvulus) purpureus. Other additions to the basic binomial name include subspecies, varieties and cultivars. A subspecies (preceded by the abbreviation “subsp.”) is a geographically separate population within a species that is almost, but not quite, a separate species. A botanical variety (preceded by “var.”) is a distinct variant occurring in the same populations as ordinary examples of a species. A cultivar (CULTIvated VARiety), or selection, is a type that is maintained in cultivation (is not naturally occurring). Cultivar names are a word or words in a modern language (NOT Latin) set off in single quotes and capitalized, but not italicized, such as S. splendens ‘Bonfire’. Hybrids, or crosses between different species, are given unique names that are preceded with an x, indicating that this plant is a hybrid between two species — but, unfortunately, it doesn’t tell us which two species. For example, you’d never know that the common garden perennial Salvia x superba is a hybrid of S. sylvestris and S. villicaulis, unless you look up that relationship somewhere. Sometimes that “x” inadvertently gets dropped along the way; this plant is often listed as S. superba. 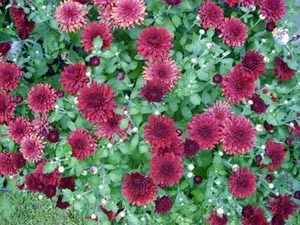 Chrysanthemum or another genus now? When botanists make taxonomic name changes as a result of advances in botanical knowledge (e.g. the Chrysanthemum genus was recently split into eight different genera, including Dendranthema, Tanacetum, and Leucanthemum) it may take years for the horticultural industry to adopt them. New names generally become widely accepted in botanical literature and serious garden writing but many catalogues and seed packets stick to the old names, resulting in inconsistencies in the names of plants. Many nurseries offer trademarked products (a trademark is legally defined as a word(s) or symbol which identifies the place of origin of a product, designated ® or TM) that can not be sold as such without permission (cultivar names must remain free for everyone to use). These were first devised as a marketing tool to sell good plants that had bad cultivar names. Sometimes trademark names are misused as cultivar names, even though this violates both trademark specifications and nomenclatural rules. For example, Acer rubrum Red Sunset® is ‘Franksred’, but it is sometimes incorrectly designated in catalogs as ‘Red Sunset.’ And some nurseries have intentionally given new introductions poor cultivar names and great trademarked names to make it harder for their competition to market the same plant. To complicate things further, certain cultivars are marketed under different trademark names: Rosa ‘Korlanum’ is marketed under the three different trademark names Surrey, Sommerwind, and Vente D’ete. The end result is people end up associating the trade name with a particular plant name rather than the cultivar name. No wonder even the experts can get mixed up over which is a cultivar name and which is simply a marketing name! While it’s quite appropriate to use common names when everyone knows what you mean, often it’s much better to use the proper botanical name. By their very nature, common names are only given to common plants. But common where? Plants common in one place aren’t common in another. Also, many plants have more than one common name. In England the white waterlily (Nymphaea alba) has 15 common names, and if you include the common German, French, and Dutch names, it has over 240 names! 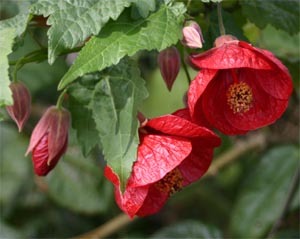 Abutilon: flowering maple isn’t a maple. Some common names are used to refer to several different species. A plant in Georgia called ironweed is in the genus Sidai, whereas in the Midwest ironweed refers to a plant in the genus Vernonia. And what’s a bluebell? This common name refers to several plants belonging to completely different families, including Boraginaceae, Campanulaceae and Liliaceae. Using a general name doesn’t provide a lot of information about that plant. Ask for a sage plant — is that a culinary one, an annual ornamental or a perennial; which of about 400 species of Salvia do you mean? Common names also may be misleading. Yellow flag is an Iris; Spanish flag isn’t (it’s Mina (=Ipomoea) lobata, related to sweet potato). Flowering maple (Abutilon sp.) isn’t a maple, but is related to Hibiscus (and velvetleaf). And creeping gloxinia isn’t a gloxinia (it’s Asarina erubescens, family Scrophulariaceae, while true Gloxinia is in the family Gesneriaceae) — even the misnamed “Gloxinia” of the florist industry are really hybrids of Sinningia speciosa, and unrelated to this genus. And finally, some plants, especially those that are rare, don’t have common names. Therefore common names are not as reliable as botanical names for identification purposes. Latin is the international language used by scientists all over the world to name plants and animals. That’s because when Linnaeus devised his system for classifying plants, he wanted to use a language that would be understandable to the largest number of people, and Latin was a language that most educated people knew in the 18th century. You don’t have to know Latin to grow beautiful plants, but it can be quite helpful to know a little bit about plant names when discussing with others, reading about, or shopping for a plant. Since the specific epithet describes some characteristic of the plant, botanical names often give clues about what to expect from the plant (but these references may be rather cryptic). The name may indicate the color of the flowers, the height of the plant, whether the leaves are long and thin or short and fat, whether the plant is prickly, geographically where it comes from (which often is related to how hardy it is), the habitat it occurs in naturally, whether it’s a creeper or climber, is deciduous, has a bulb, is edible, or something else noteworthy about it. 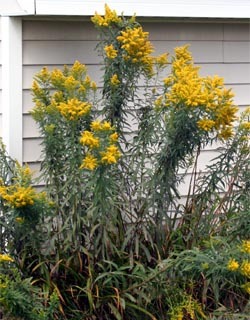 If aurea is in the name, the foliage or flowers or are probably yellow. Something named canadensis is likely to survive our winters. The table below lists many commonly used descriptive terms. (To simplify things, mainly feminine endings are included; the same word, but ending in -us or -um, means the same thing. Like many other languages, Latin assigns genders to all its nouns, and adjectives have to agree with the gender of the noun they describe. In plant names, therefore, those that are deemed masculine end in -us, while those that are feminine end in -a, and those that are neuter end in -um. And plurals end in -i. Learning and using Latin names seems to intimidate a lot of people, but it really shouldn’t. In fact, you already use many Latin names: Begonia, Clematis, Crocus, Delphinium, Forsythia, Gardenia, Geranium (the hardy one, not Pelargonium), Ginkgo, Hibiscus, Hosta, and Iris — or ones that are really close to the scientific name, such as Heliotrope (Heliotropium), peony (Paeonia), or rose (Rosa). 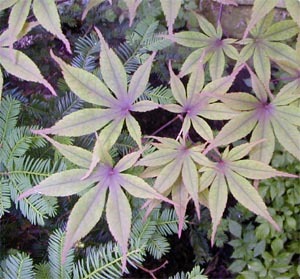 Leaves of Japanese maple, one of many plants in the genus Acer. Think about it like learning the name of a new friend. Just like people, plants have two names (not counting cultivars, etc. ), but their last name comes first (just like in the telephone book). The genus is kind of like our family name and the species the given name. So, the plant commonly called red maple, is maple, red in Latin — Acer rubrum. In the same “family” (equivalent to people families, not botanically speaking) are paperbark maple (Acer griseum), Japanese maple (Acer palmatum), sugar maple (Acer saccharum) and about 115 other species. You can gradually learn botanical names by reading them in plant books or seed catalogues, where the Latin name and common name are side by side. 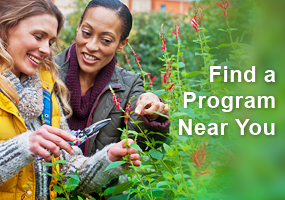 Try to interchange one for the other at times, especially at nurseries or in public gardens where the plants are labeled. 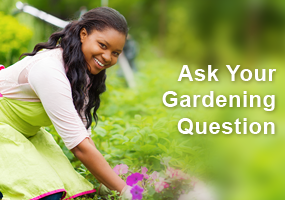 Try to only do business with seed and plant companies that provide you with the botanical name of the plant. If they don’t know what they are selling how are you supposed to know what you are growing? When first learning botanical names, don’t worry about what the names mean (plant names don’t always tell you something useful about the plant anyway). Just add these words to your vocabulary and use them when you can, just like any other word. You wouldn’t worry about what “Joe Smith” means — you just remember his name and what he looks like. Don’t be too concerned about the endings of the adjective words; remember the root of the word, and you can figure out the other part by comparing it to the ending of the genus. For example, sibirica, sibiricum and sibiricus mean the same thing (from Siberia), but are applied to the feminine, masculine and neuter genera, respectively: Achillea sibirica, Geranium sibiricum, Leonotis sibiricus. As you’re memorizing these names, keep in mind that every botanical name refers to one and only one plant. When you use these word combinations, other gardeners will generally understand what you mean, even if you don’t get the name exactly right. Now we come to the issue of pronunciation, which probably scares more people away from the use of botanical names than anything else. Everyone feels unsure, or possibly embarrassed at times, trying to pronounce botanical names in the company of others — especially if the other(s) is perceived as more knowledgeable. (If you think Latin is difficult to pronounce, try English. How is ‘ough’ pronounced? As in thought? Through? Enough?) But you really shouldn’t worry so much about it. After all, Latin is a dead language, and we don’t have any ancient Romans around to correct us! Just proclaim it with confidence. If the person you’re talking with understands what plant you mean, your pronunciation is good enough. 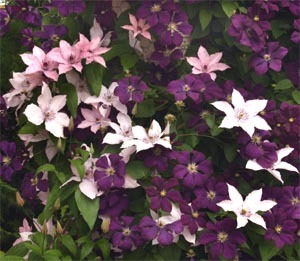 Clematis: a pretty flower no matter how it’s pronounced. Most languages evolve over time, so there really can’t be any truly ‘correct’ pronunciation, just different pronunciations at different times (and places). And with an increasingly mobile and global society, interactions with other cultures influence the way we speak. Thirty years ago, few Americans would say “CLEM-atis,” but now so many have heard English garden lecturers say it that way, that they reject “cle-MAT-is” as substandard – despite the fact Americans have been saying that for 150 years. For gardeners, I think the most important rule is to pronounce every letter and in the correct order. Unlike English, with all those silent vowels and dipthongs and whatnot, just separate the word into syllables and say it like it sounds. You might want to say each syllable separately, then string them together so you don’t leave anything out or mix up the sounds (as people do when they pronounce “anemone” as “anenome”). As long as you say all the letters, the listener should be able to figure out what you mean, even if your pronunciation differs from theirs. They might even think you know something they don’t! Of course, there are a few exceptions to the rules. Names that are commemorative in derivation (named in honor of a person) should be pronounced the way the person’s proper name is spoken. For example, Halesia, a genus of small trees with white pendulous flowers, was named after Dr. Stephen Hales. Thus the pronunciation should be “Hales – EE – ah” not “Ha – LEE – see – ah” like you’d think. This becomes difficult when those commemorative names are Russian or Chinese – or you don’t realize the word is someone’s name – so all you can do is try your best. Also, even if you’re following the rules of Latin pronunciation, be aware of what the word might sound like. I doubt many Americans would pronounce the genus for pine (Pinus) as “Pee – nus” — even though this is technically the correct pronunciation in Latin — for the embarrassing coincidence with male anatomy. So sound it out, use some common sense, and start saying those botanical names! For botanical taxonomy, the ultimate authority is the International Association for Plant Taxonomy (IAPT) and their International Code of Botanical Nomenclature. 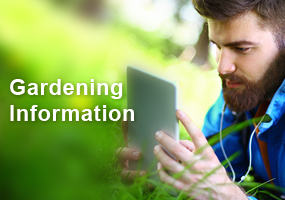 The last word on horticultural taxonomy comes from the International Cultivar Registration Authorities. Their book 7th Edition of the International Code of Nomenclature for Cultivated Plants, published in February 2004 (ISBN 90 6605 527 8), includes the rules for naming plants in cultivation, as well as a comprehensive glossary of terms used in nomenclature. Your article is much informative and it helped me a lot to clear my doubts. Please reply to my following query. What does monosperma mean in Butea monosperma? I’m wondering about plant names that are like this: Rosa Jacqueline du Pré = ‘Harwanna’ (S). What does the Harwanna refer to? This is just a question for school and I feel like I’m over thinking it but, say I just discovered a new fescue (Festuca) species that is hairlike in texture. What Latin name, including the authority, will I give to this species? Very interesting article to read for continuing ed but not sure I will ever pronounce the latin names correctly.